The United States Congress designated the Miller Peak Wilderness (map) in 1984 and it now has a total of 20,251 acres. All of this wilderness is located in Arizona and is managed by the Forest Service. 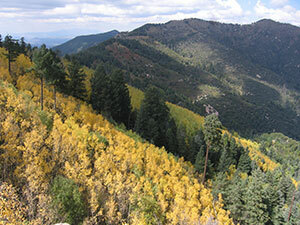 The Miller Peak Wilderness lies between the city of Sierra Vista and the Mexican border in the southern half of the Huachuca Mountains. The Arizona Trail traverses this wilderness before reaching its southern terminus at the U.S./Mexican border. More than 170 species of birds have been spotted here, including 14 kinds of hummingbirds. More than 60 species of reptiles and 78 species of mammals inhabit the area. Elevations range from 5,200 feet to 9,466 feet atop Miller Peak, the highest and southernmost peak in the United States. Once cloaked in pine and fir, many recent fires have converted much of this area to predominantly oak, aspen and grass vegetation. Many sheer cliffs rise hundreds of feet above the canyon floors. At least 21 trails lead through the Wilderness from its eastern, western, and southern boundaries. From the Crest Trail (11.5 miles) one can reach the top of Miller Peak. Throughout the area, visitors may encounter evidence of the region's bygone mining and ranching days. Visitors are urged to use caution in this wilderness due to illegal drug and human smuggling activity associated with the nearby international border. Stay alert and move away from any suspicious activity before attempting to contact authorities. Camping away from trails and water sources is recommended. Contact the local Forest Service office for current information. A large wildfire that began in Mexico burned through much of the Miller Peak Wilderness in summer, 2011. Some trails are still closed and visitors are urged to use caution and watch for falling trees and other hazards. Contact the local Sierra Vista Ranger District office for current conditions and closure information. Planning to Visit the Miller Peak Wilderness? How to follow the seven standard Leave No Trace principles differs in different parts of the country (desert vs. Rocky Mountains). Click on any of the principles listed below to learn more about how they apply in the Miller Peak Wilderness.